I have about 90 seconds before I have to be in a meeting so here’s the deal! The Goosebumps trailer debuted after a very short “unlock with a hashtag” campaign. As I was hoping, the werewolf is featured prominently, and despite being CG, is rendered with perfect levels of realism and cartoon villainy. 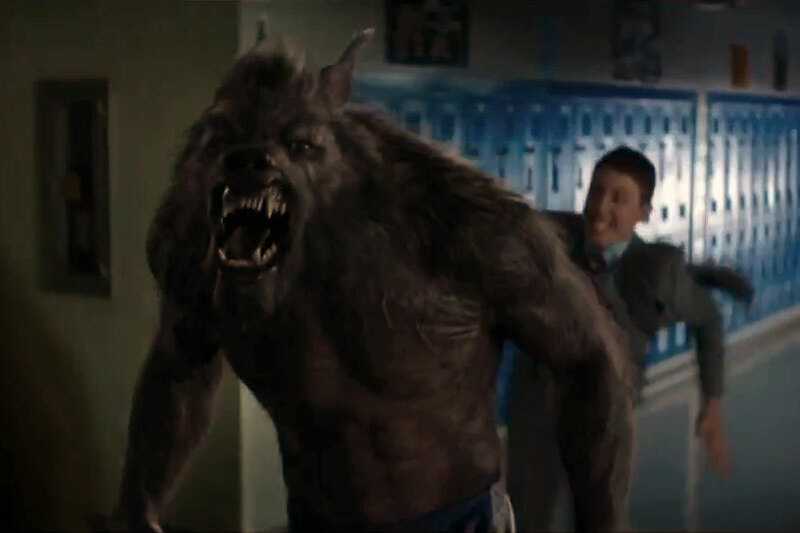 The screen-grab below is from a scene set in a high school hallway, with Ryan Lee’s character preparing to bite the werewolf with his silver fillings. There’s another scene towards the end of the trailer, set in a supermarket, in which the werewolf seems to be wearing blue shorts and shredded high-top sneakers. I’m not sure which Goosebumps book that’s from – not The Werewolf of Fever Swamp, for sure – but it doesn’t really matter. The movie looks like it’s full of kid-appropriate freak-outs, it’s got a delightfully broody Jack Black, and the werewolf doesn’t look dumb, so I’m happy!